Originally probably called Eaglais Thomhaldich and dedicated to one of St Columba’s missionaries, its simplicity, to some extent , indicates its antiquity. 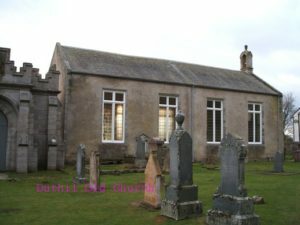 The Kirk itself has undoubtedly been renovated on more than one occasion – particularly in the late 19th century but also, one might assume, after its burning down on a fateful day towards the end of the 15th century. On this day Grants took revenge on their arch enemies/neighbours for the murder of their clan chief. Fleeing Comyns took refuge in the church as a place of sanctuary but a flaming arrow fired from outside set the roof on fire and with it those sheltering inside. The granite gravestone in the kirkyard is relatively new but is dedicated to Walter Stewart – the first Baron of Kincardine and and a grandson of Robert 11 of Scotland and one of the heroes of the great Battle of Harlaw fought in 1411. This Stewart Barony remained in existence until the Battle of Culloden in 1745, It was another Stewart – John Roy Stewart, also born in Kincardine, who was one of the heroes of that battle and those under his command fought under the “Green Flag of Kincardine”. It is perfectly conceivable that he too worshipped in this Kirk. 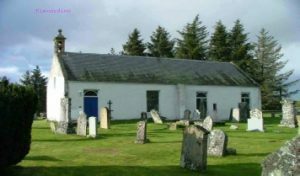 Kincardine has been served in part by a “missionary minister” based in Abernethy or Duthil and in part by its own Minister living in the Manse which was sold in the 1950s as it was ;proving very difficult to find an incumbent. Its interior is relatively plain but the War Memorial on the left hand wall shows just how widely drawn its congregation was – bringing in worshippers from the then populous Tulloch, Kincardine and even Glenmore. It then served a population which lived in very different way to that of today. Some 20 years before Boat of Garten came into being as a village as a result of the building of the Railway Station which lay on the rail line between Blair Atholl and Forres and also the accommodation necessary for those who would service that railway, As part of that growth a post office, a hotel and a merchant’s shop were established. 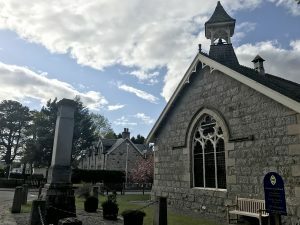 In the intervening period up to 1881 Church services were held variously in the local school and in the waiting room of the Station with the Minister from Duthil Old Kirk officiating – no mean task as he also had to cover the similar Railway village of Aviemore. Duthil Kirk Session Minutes record a meeting, probably held in the Boat Hotel, attended by the Rev James Bain, Duthil Minister, the Missionary Minister, the Postmaster, the Stationmaster, the Hotel Keeper and representatives from Duthil. At the meeting it was agreed that an approach be made to Seafield Estates for a piece of land on which to build a church. This was duly done – then there ws a lengthy gap , possibly due to lack of funds or because of a misunderstanding between the Church Committee and the Estate about what sort of church was intended. Thus it was not until 1901 that everything was agreed and building started, being finished and dedicated on the 9th Sept 1900 at a cost of £717. Boat of Garten and Kincardine became a parish in its own right in January 1932 necessitating the purchase of a Manse. 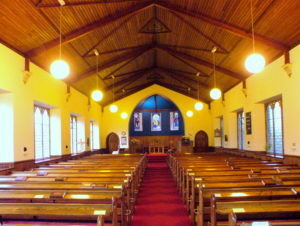 The Church itself was extended by the building of its Church Hall and Chancel in 1936. 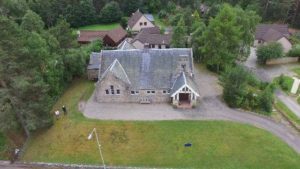 In more recent years there have been a number of changes most notably the creation of a Linked charge (subsequently united charge) with Duthil Church (since 2017 known as Carrbridge Church) with the Minister resident in the Manse in Boat of Garten. Thereafter there was the creation of linkage of a similar nature with Abernethy (Nethybridge) Church. In 2013 we welcomed our new Minister Rev Donald Walker, who retired in 2018. The first recorded church at Duthil, dedicated to St Peter, was built about 1400, probably on the site of an earlier building. The church has been rebuilt on several occasions. The New Statistical Account reports the pre-Reformation building was ‘taken down in 1826’ and a new, ‘excellent edifice’ built the same year. Plans held by the National Records of Scotland show the 19th century interior was focused on a raised pulpit on the long south wall. Three galleries, off both the east and west w alls, and off the north wall, sloped down towards the pulpit, and the ground floor seating was also arranged facing the pulpit and to each side. At the same time the Seafield burial vault under the previous church was replaced by the self standing first Mausoleum.The church was again renovated just before World War I by the Glasgow architect Peter MacGregor Chalmers, when the intention was to provide space for an organ and choir. Old Duthil Church closed for services in 1967. 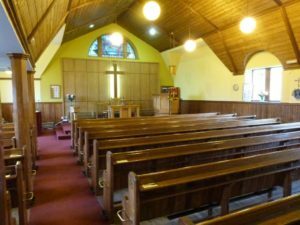 When the building was closed and sold, its pulpit and Communion table and chair were removed and re-installed in the former Carrbridge United Free Church, which is still (2017) used for worship by the current Church of Scotland congregation in Carrbridge. Additionally, a number of memorial plaques were removed from the walls and re-hung in the Vestry of the Carrbridge Church, where they remain. Outside the Church there is an interesting, possibly pre – Reformation, Baptismal font similar to that found in Kincardine. 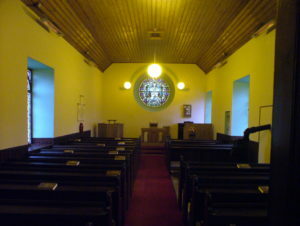 Carrbridge Church is the church in current usage for the Parish. Opened in August, 1909. In 1976 it underwent a transformation with the completion of an extensive renovation scheme costing £7,609.It included the remodelling of the chancel to house the pulpit, Communion table and chair, from the disused OLD PARISH CHURCH AT DUTHIL. The Communion table is in memory of the Rev Patrick Grant, minister of Duthil in the late 18th and early 19th Centuries. From him were descended through his daughter, a number of distinguished people who are commemorated by Duthil memorial tablets. They include Field Marshall Sir Patrick Grant and General Sir Henry Fane Grant. These tablets were “rescued” and placed in the Duthil Chapel – formed in what was the rear of Carr Bridge Church. The transept, was closed off to form a church hall. A feature of the renovation is the panelling at the back of the chancel, which is floodlit, and the cross which is lit from the rear. The Woman’s Guild provided a red carpet in the chancel. Oil-fired central heating was installed, boosted by radiators from Old Duthil Church. The renovated church was dedicated by the Rev Dr Horace Walker, Secretary of the Church of Scotland Home Board. The Congregation is very active in its outreach and focussed opn spreading the Gospel to all its constituents.